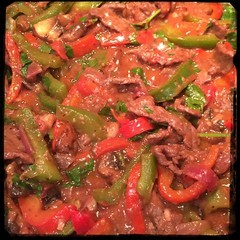 Pepper Steak may have it’s root in Asian cuisine but I wouldn’t tell that to an Italian. This classic take on an Italian family favorite is best served with rice rather than pasta. remove marinade from steak (save marinade) and let drain for about 15 minutes, pat dry if you like. 1. Heat 2-3 tbsp of olive oil on medium heat and sauté onions (and the optional hot pepper flakes) adding the garlic as the onions begin to turn translucent. 3. Toss in the floured and seasoned steak strips and let cook for 10 minutes or so. 6. Add the sliced Cremini mushrooms (optional). Let simmer until the mushroom begin to soften. 7. Add the 1/2 cup hand-crushed tomatoes and let simmer for a few minutes. 8. Add the freshly squeezed lemon juice, let simmer for a few minutes. 9. Fold in the chopped flat-leaf parsley and serve over brown rice.